Bragi Dash Pro: wireless 'ear computers' custom fitted to your ear canal | What Hi-Fi? They're an upgraded version of the Bragi Dash, and you can have them personalised for a perfect fit. Bragi has announced the Dash Pro, an upgraded version of the Bragi Dash headphone launched in 2014. The Dash was one of a growing category of 'hearables' i.e. headphones that boasted the kind of fitness tracking skills you'd usually find in a wearable device. Like the Dash (and the Apple AirPods), the Dash Pro are completely wireless. It's essentially two earbuds that talk to your mobile device over Bluetooth. The advantage of a cable-free design is there's nothing to get tangled up in. The downside? It's easier to lose one or both earbuds, as they're not connected to anything. There's also a selection of custom-fit models on offer, called 'Bragi Dash Pro tailored by Starkey'. They'll be on sale exclusively through a personalised shopping experience at 5,000 audiologists across the USA and Canada. The Dash Pros feature the same audio transparency feature as their predecessors - this minimises background noise so you can focus on what you want to hear. 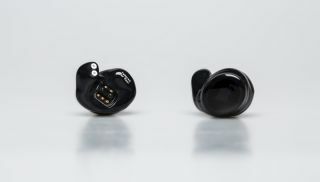 Bragi promises reduced white noise, and new foam tips for providing better bass and a more secure seal with your ear. The design has been tweaked a little since the original Dash - the aluminium slider is now a gunmetal colour, with blue or gold leather inlay. It keeps the same Kinetic User Interface as its predecessor - this lets you control the device just by moving your head. New features include real-time translation courtesy of iTranslate, and auto activity tracking (so it knows if you're running, swimming, or cycling without you having to tell it) that records your stats accordingly. Like their predecessor, the Pros have 4GB of onboard storage so you can leave the phone at home and listen to your tunes while running. The Pros cost €349 (£297) and 'Pro tailored by Starkey' will be $499 (£386). Both are available now, though the latter is only in the US and Canada.